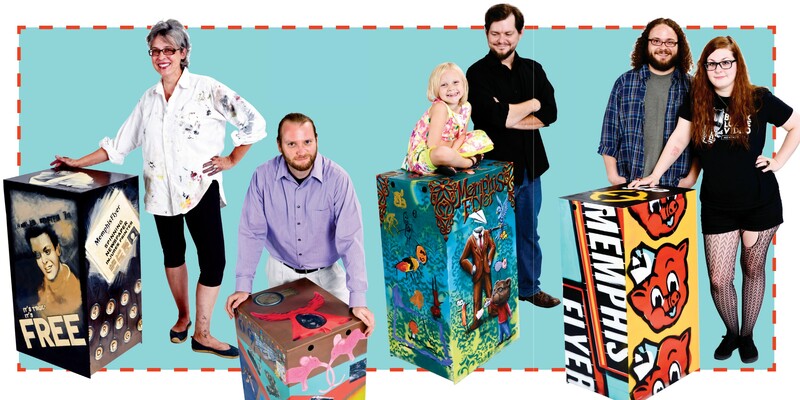 The results of this year's Flyer Box Art contest exceeded all expectations. Thirteen artists transformed 11 of the Flyer's ordinary newsstand boxes into gallery-worthy art that will soon make Memphis an even more colorful place. Now in its second year, the Flyer Box Art contest drew another father-daughter team, students, and working artists. They turned in boxes that ranged from flat-out adorable and super-trippy to outrageously slick and sweetly thoughtful. 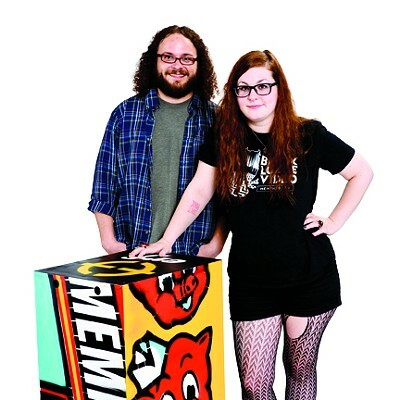 Again this year, you can vote for your favorite box in the "Readers' Choice" contest online at memphisflyer.com, starting this Thursday, October 3rd, and running through October 31st. The winner will receive $500. Thank you to the Art Center for its continued support of this contest. Mary Norman has been a member of the local art community for many years but took a 12-year hiatus to raise her son. Her reentry into the scene was huge. It was Norman who created the steam-punk-style mural with the sprockets and ominous giant eye on the security offices in Overton Square. 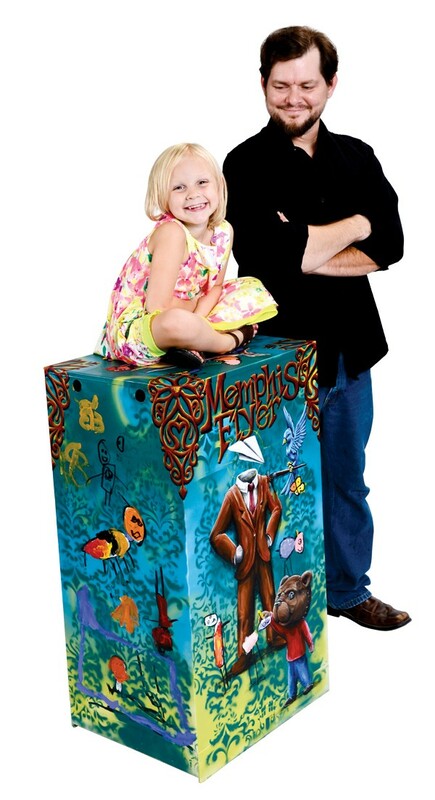 Norman's Flyer box, though on a smaller scale, is every bit as dramatic as the Overton Square mural. 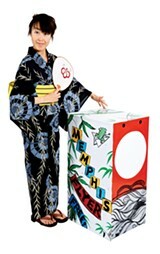 The theme is "Stop the Presses," and it's an homage to the newspaper biz as represented in old black-and-white movies. Orson Welles of Citizen Kane flanks one side of this shades-of-gray box; the sharp-as-a-tack Rosalind Russell of His Girl Friday appears on another side. Other flourishes include a sprinkling of typewriter keys and the spinning world of old newsreels. At top is an amazing 3D fish, which Norman notes is her way of saying that the idea of print newspapers being obsolete is exaggerated. You can't, after all, wrap a fish in a computer. 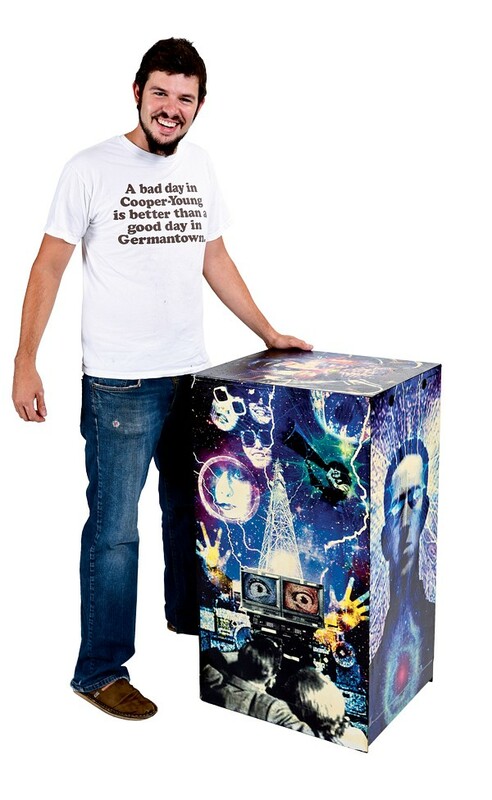 Muralist Jason Miller's art box can best be described as psychedelic folk art, with pink elephants, army tanks, and action figures adorning the box. Miller's box also features a lot of memorabilia specific to the artist: an Elvis autograph owned by his mother, a teething toy, ornaments from his grandmother, and old paper planes the artist made as a child. Using archival spray paint as a base before sectioning off different areas of color, Miller's art box looks complex without being cluttered and serves as a great introduction to this accomplished artist's work. Location: 5425 Poplar, in front of Outdoors Inc.
"I draw lots of good things," Mollie Parten tells us. Among those good things are unicorns and butterflies and herself. Mollie is 5. Her partner-in-art is her dad Nathan, a tattoo artist at Trilogy and the creator of the Day of the Dead-inspired Little Dead Things prints and candles sold at the Brooks. The Partens, who previously collaborated for a show at Tsunami, delivered a colorful box with lots of playful, storybook-like details. That huggable little button-eyed tiger stands for the Memphis Tigers, and that just-as-cute bear is for the Grizzlies. The blue house swarmed by musical notes represents Memphis as home of the blues. 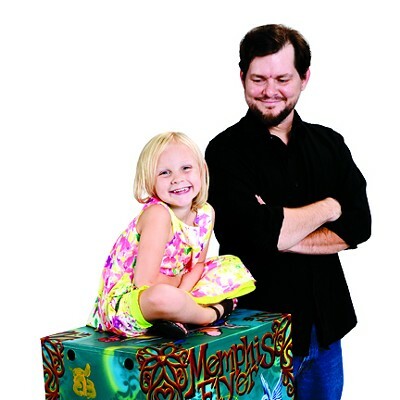 "Memphis is a big old playground — sports, music ... unicorns," Nathan says, summing up the box. Mollie's contributions to the box include, yes, a unicorn, a butterfly, and herself. 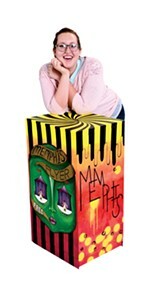 She's also immortalized on top of the box. In this portrait, she has rabbit ears and, naturally, a unicorn's horn. The iconic smiling pig that once gazed out over Madison and other Piggly Wiggly locations in Memphis may be a thing of the past. But Mr. 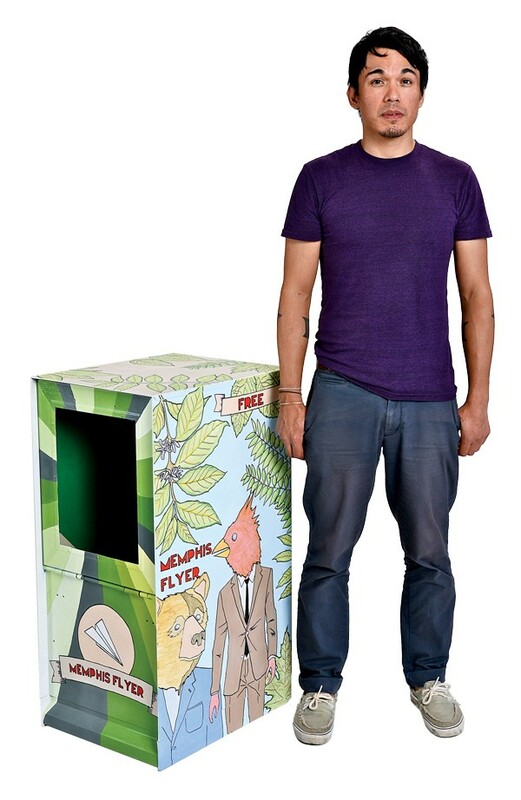 Pig lives on, thanks to the Flyer art box by the ERF design collective. The pop-art-style box features a stencil of Mr. Pig spray-painted in bright colors. Created by Lauren Rae Holtermann (full disclosure: Holtermann works in the Flyer's art department) and Ronnie Lewis, the box is a salute to the fact that Memphis was home to the first self-service grocery. "My dad said, 'Why would you do that? There are no more Piggy Wigglys,' and I said, 'Exactly!'" I miss seeing that pig everywhere," Holtermann says. 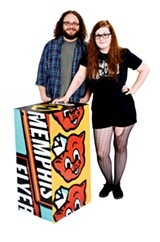 Holtermann and Lewis collaborate with a couple of other artists in ERF to create album art and posters for metal shows at the Hi-Tone and Minglewood Hall. Holtermann painted a Flyer box last year as well. 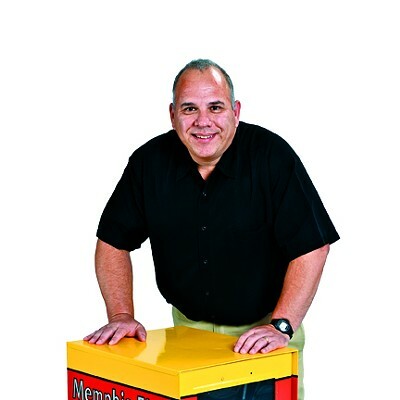 Gino Barzizza's wife signed him up for a Flyer box without telling him. But the graphic designer wasn't fazed. He even scrawled a love message for his wife on the inside of the box. Barzizza printed a sci-fi scene onto vinyl using an ink jet printer. "It's about shared visions and how, with the internet and computers nowadays, something that was once metaphysical and magical is now technological," Barzizza says. 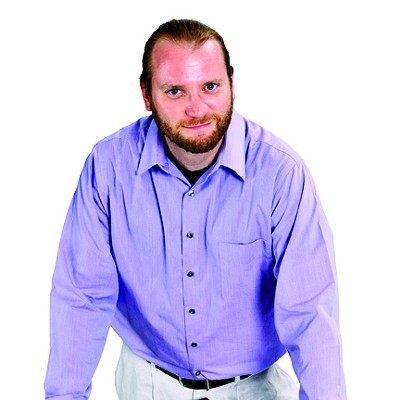 "You can witness all the stuff that everybody else in the world is witnessing, and the only thing you have in front of you is a computer." In Japan, during the Tanabata festival, people write wishes on slips of paper and hang them on bamboo, along with other decorations. Then the bamboo is set afloat on a river or burned after the festival. Masumi Oizumi painted a bamboo stalk decorated with iconic Memphis and Southern imagery, such as the Pyramid, catfish, W.C. Handy, and a pig. "Memphis Flyer" is spelled out on the wish slips. Oizumi was a textile designer when she lived in Japan, but since moving to the United States, she hasn't been doing much in the way of art. She says the design contest was her way to reacquaint herself with her old hobby. When she's not painting, Oizumi and her husband bake bread to sell at the Local Lynx Farmer's Market at Rhodes College. 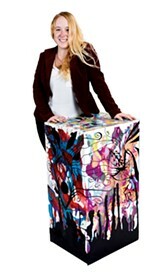 Grad student April Pierce says she wanted to keep things simple and playful with her art box. 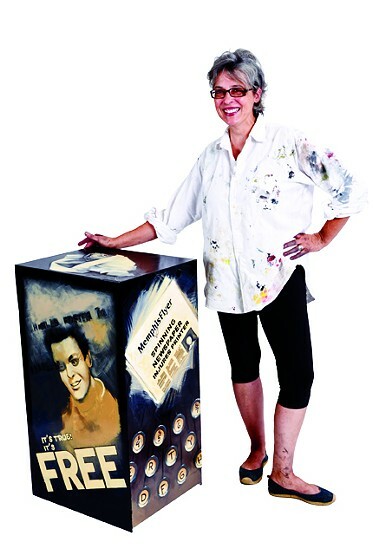 Pierce took snapshots of people she knew reading the Flyer as a starting point, before painting characters inspired by her photos on the box and filling up the space around them. Pierce admitted that using enamel paint for the first time was a challenge, but the chance to have her art seen by people around town made it worth it. "I see the boxes from last year around town all the time, and I think it's just a really fun way to liven up the landscape, so I'm really happy to be a part of it," Pierce says. The Flyer box created by graphic designer Robert St. Clair looks like it might zoom off the pavement, thanks to a paint job suitable for a souped-up Camaro. St. Clair says he decided on the automotive aesthetic, because it would quickly draw attention in a high-traffic area. St. Clair approached painting the box the way you would a sports car, using four coats of clear paint, lettering enamel, and stripping tape. The result is the fastest-looking Flyer box to date. 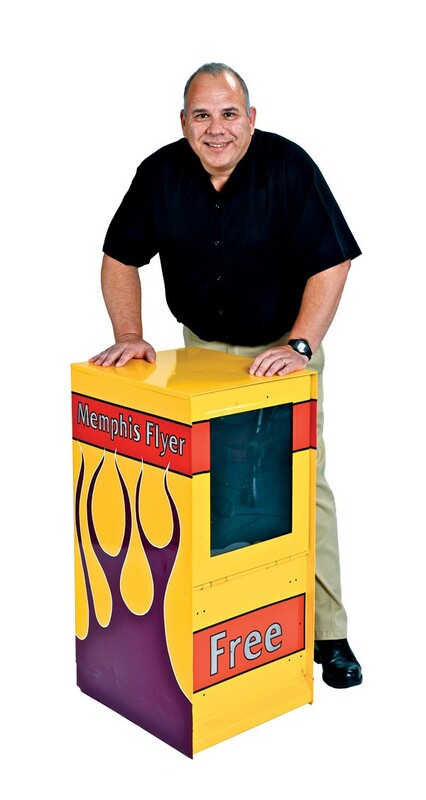 Pete Hoffecker's Flyer box features illustrations of the three major sports mascots in Memphis, all dressed in suit and tie. A redbird, two tigers, and a grizzly adorn the box, looking similar to characters from a Richard Scarry children's book. 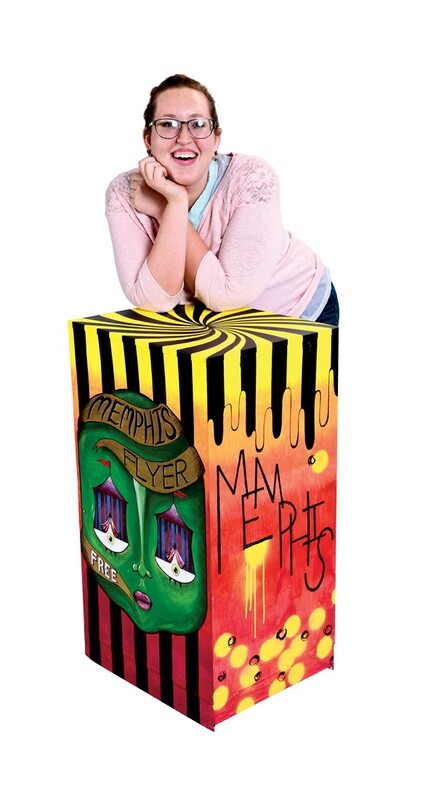 Says Hoffecker of his box: "I wanted something that represented Memphis without going overboard and putting Elvis on there, so I decided on a really slight head nod to the sports teams here. The other filler is to make it look more organic and natural. 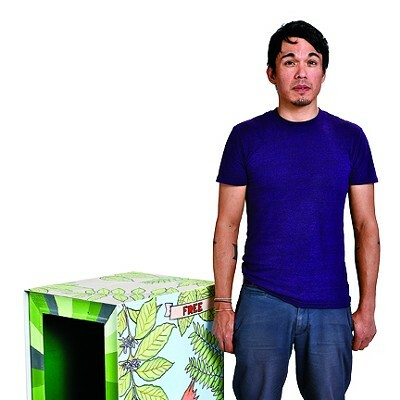 I'm interested in indigenous art, and I wanted to make sure that was represented with my box." Lindsey Penn studied dance, but this self-taught artist says, "I've always had a knack for making stuff." Penn recently attended Burning Man and drew inspiration from the annual festival geared toward "radical self-expression." 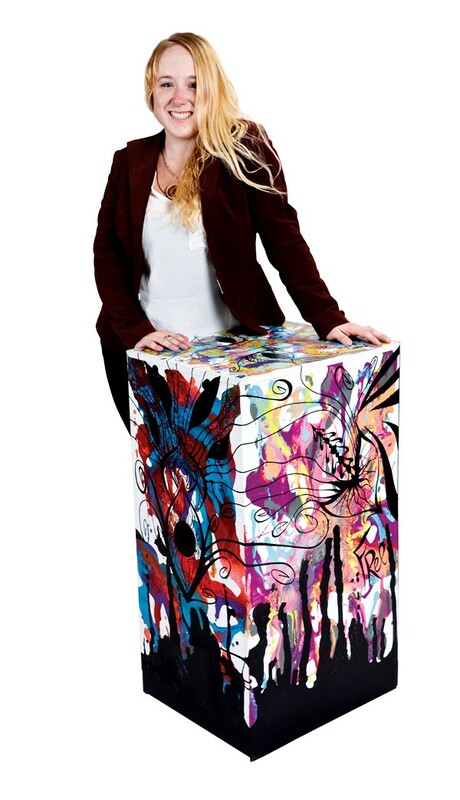 Her box is an abstract work with brilliant splotches of color — yellows, greens, pinks, and oranges — all battling for the eye. Order comes in the beautiful, free-hand, calligraphic black lines that float to the surface. Recognizable shapes appear. One pattern could be a lion's face. Or is it a squid? Penn says her thought-process was that there was no thought-process. "I don't start with a plan. I just do," she says. "It becomes whatever." When pressed to describe her entry, she says, "My box is chaos." "I wanted to do something to put myself out there," Paige Ellens says, explaining why she entered the contest. "Out there" is also an apt way to describe her Flyer box, though the adjectives she uses are "funky," "crazy," "eccentric," and "bizarre." 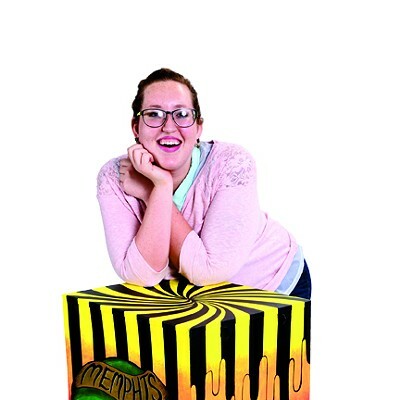 The theme for Ellens' box is "Memphis Is a Circus." She began by painting wide vertical lines. Then she created fabulous morphing tableaus. On one side is a giant pair of lips, teeth that evolve into curtains, and a green tongue that serves as a lawn. On the other side is a green face with eyes that can also be read as circus tents. For the lettering, she borrowed from old circus flyers. Says Ellens, "I was going for something crazy, quirky."